Plextek Consulting has unveiled the world’s first immersive medical trainer using Oculus Rift virtual reality headset. Just like gamers, British soldiers could soon could experience life-like battlefield scenarios in a fully immersive environment. Plextek Consulting has just announced the world's first immersive medical training system for the military using the Oculus Rift. According to the developers, it can simulate pre-hospital care on the battlefield and requires trainees to "negotiate and prioritise" clinical needs while under virtual fire. Screenshots of the simulation show a wounded soldier sat against a rock with a foot torn off and blood trailing off into the distance. Smoke and explosions can be seen in the background and a rocket-propelled grenade is lying just ahead of the soldier. Wearing the Oculus Rift allows a medic to take in their surroundings and, by using a hand-held controller, attend to the casualty. A 'simulator controller', responsible for the simulator and what it displays, can make things much more complicated for the trainee. They can decrease the consciousness of the injured soldier, simulate sniper fire or even trigger a bomb attack. Plextek Consulting says the technology could be used to improve the negative psychological effects soldiers suffer when they experience medical trauma on the battlefield. 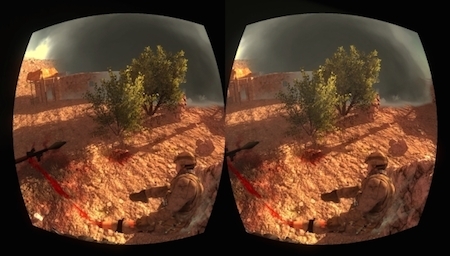 Using virtual environments could be used to expand existing methods for soldiers' medical training, which includes using amputee actors with realistic make-up to simulate injuries. SF readers recall John Varley's novel Steel Beach presents a computer that provides therapy by projecting children into a sort of virtual world (actually implanting false memories of living in a fantasy world). Also, Roger Zelazny wrote a novel called The Dream Master in which a therapist controls a virtual world to help patients using a dream console in which a therapist can control the patient's dream experience to help advance his therapy.